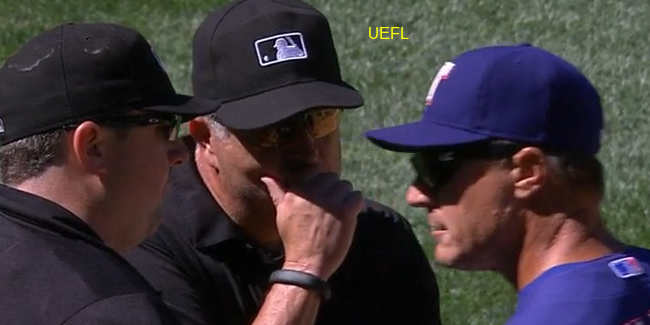 HP Umpire Lance Barrett ejected Rangers Manager Jeff Banister for arguing a strike one call in the top of the 8th inning of the Rangers-Mariners game. With one out and one on, Rangers batter Mitch Moreland took a 0-0 fastball from Mariners pitcher Fernando Rodney for a called first strike. Replays indicate the pitch was located over the heart of home plate and below the hollow of the knee (px .008, pz 1.425 [sz_bot 1.73]), the call was incorrect. At the time of the ejection, the Mariners were leading, 4-2. The Mariners ultimately won the contest, 4-2. This is Lance Barrett (94)'s second ejection of 2015. Lance Barrett now has 0 points in the UEFL Standings (2 Previous + 2 MLB - 4 Incorrect Call = 0). Crew Chief Dale Scott now has 5 points in Crew Division (5 Previous + 0 Incorrect Call = 5). This is the 155th ejection of the 2015 MLB Regular Season. This is the 71st Manager ejection of 2015. This is Jeff Banister's 3rd ejection of 2015, 1st since May 31 (Todd Tichenor; QOC = N [Safe/Out]). This is Lance Barrett's first ejection since April 22, 2015 (Dave Hudgens; QOC = Y [Balls/Strikes]).